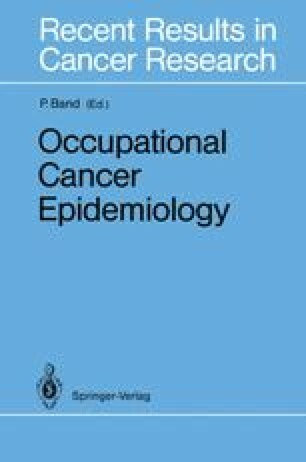 Population-based cancer registries provide a unique opportunity for epidemiologic research aimed at identifying occupational cancer risks. However, this potential has been underutilized due to insufficient information on occupation and industry or data on important confounders such as cigarette smoking, alcohol consumption and socio-economic status (McCrea Curnen et al. 1984). Due to these limitations, occupational studies using population-based cancer registries for case ascertainment have generally focussed on studies of occupational risks associated with a single tumor site (Jarvisalo et al. 1984; McLaughlin et al. 1987; Pearce et al. 1986a,b), and have rarely encompassed the broad spectrum of human malignancies with the possibility to control for confounding variables (Williams et al. 1977). Supported by grant # 6610-1395-53 from NHRDP, Health and Welfare Canada, and by grants from the Workers’ Compensation Board of British Columbia and the Vancouver Foundation. The authors are indebted to Mrs. Jean van den Broek for secretarial assistance.